Our most informal meet of the year went ahead as planned meaning that I didn’t have to roll out Plan B (Skexit) after all. Mike and Fiona warmed up for the weekend by completing the Cuillin Ridge traverse from S to N on Thursday, encountering clag and greasy surfaces early on and having to bypass the TD gap. They were treated to a fantastic brocken spectre on the Inn Pin and a clean sweep of King’s chimney and Naismith’s, and quite deservedly stuffed themselves with cake etc after an epic day. Despite stunning weather with 28 degree heat and nae midges they did jolly well nothing on Friday. Myself and newbie Fabien had planned to co-ordinate with PNM David T on the summit of Sgurr Airgid near Morvich, however some timing issues (Claire time…) resulted in David having to wait so by the time we met him in a tick and cuckoo-infested heath part-way up the hill he’d had a 50 minute nap on the summit in the sunshine and was sporting an impressive red/white colour scheme! Alison managed to pocket the Munro top on Beinn Sgritheall at last and was impressed with the route back down. Gillian joined the group without Margaret, who’d nadgered her leg after a few days in Scotland and retreated back to the Vale of York which is hopefully flat enough to aid recovery. Fiona M had been climbing at Neist with Susan J. A few of us had the traditional barbecue that evening at the campsite and found that whilst £3 for a bbq is indeed good value, it doesn’t necessarily mean that it will be good quality: Rebecca’s squeezy water bottle acted as an impromptu fire extinguisher for the parched grass around the base. Nevertheless the classy M&S sausages and skewers were well tasty despite being the consistency of Teflon, and even confirmed veggie Pamela agreed; her corn on the cob and fish had been slightly tainted during the cooking process. Rebecca provided some hot choc with very generous proportions of Jack Daniels for afters. On Saturday Alison, Kenny, Fabien, Fiona and Mike (mobile again after a day off post-ridge) headed up a grade 3 scramble on Preshal Mor near Talisker. It was admittedly “quite short” but it was a good route. Fiona M was climbing on the Cioch with Susan J. Myself and David headed for Meall a Suiramach above the Quiraing and the Trotternish Ridge as far as Beinn Edra via a stricken sheep, a chatty farmer and some peregrines. We also picked up a hitch hiker called Fanny (a fact which is not important). Bex and Pamela did a loop at the Quiraing and were jealous of our extra passenger, collecting two of their own without even asking their names. Alan and Anne joined the crowd after a day of adventures near Arnisdale: Alan bagged the missing Munro top and on Beinn Sgritheall and a Graham/Corbett too as a run without any navigational problems but struggled to find Anne at the bottom of the hill. They saw otters on their way across on the Glenelg ferry. Sunday was the most promising day; Fabien and Pamela went on a ridge initiation with Fiona M, doing Sgurr Dubh Mor and Sgurr nan Eag from Coire a Grundha and came back raving about it. Alan and I did a run over McLeod’s tables and back along the coast passing the Glen Ollisdale bothy, McLeod’s Maidens and the Rebel’s wood. We caught up with Nigel doing a self-imposed gear photo shoot on the first table, and as we’d run on ahead he phoned us to alert us to some sea eagles pootling in the sky off to the west! Anne went out to Neist Point to check out the cliffs and lighthouse. Gillian did the Storr and Hartaval and encountered crowds of tourists on the lower slopes. Alison, Bex and the Skye Guru were on the northernmost Cuillin Munros: Bruach na Frithe was straightforward enough but Naismith's route was a distinctly bad idea in the clag so they did a there-n-back up Am Basteir. The western pinnacles were quite exciting, and Bex was pretty stoked to have completed all her Skye Munros at last. That evening was another jovial affair, with my culinary arrangements causing great entertainment for the third night running. The focal point was some Angel Delight (remember that?!) I’d found in a shop in Dunvegan. Fiona M read out the ingredients and I can confirm that AD is the pudding equivalent of haggis: it’s best not to know what’s in it. 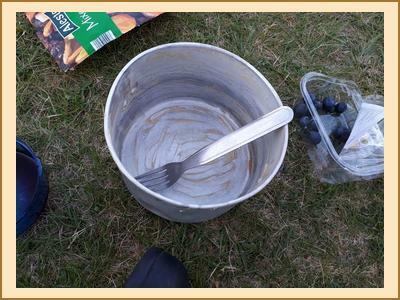 I think everyone had a go at whipping the stuff (in a billy can, using a spork) and the lucky few who ate/licked out the results were pretty merry for an hour or so afterwards! Bank Holiday Monday saw the weather change for the worse. Alison and Kenny headed to Uig via a Marilyn – “trail breaking through Sphagnum”. Gillian, Fabien and I slogged up a midgy Belig and the Marilyn Glas-Beinn Mhor and I hitched a ride back to the car. Nigel was also in the Red Cuillin on Beinn na Cro. Bex and Pamela crossed the water to walk up Ciste Dubh and Am Bathach and a successful hostage swap was completed in Spean Bridge so Pamela could go back to Edinburgh rather than Glasgow. Alan and Anne caught the boat to Loch Corruisk from Elgol and walked back along the coast, seeing yet more otters on the way. 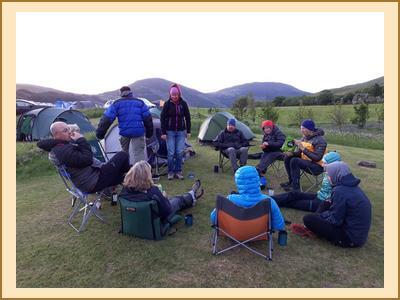 This is the first Skye meet I can remember when we didn’t have to hide from rain and/or midges in Alison & Kenny’s tent palace, and it was lovely to have the whole group gathered in a circle on various forms of seating, exchanging tales and having a giggle over a dram or two. That’s what it’s all about. Thanks all!